Does experiential marketing fit into your B2B marketing plan? Experiential marketing for B2B marketers enhances your core messaging and strengthens client relationships. However, the objectives of a B2B experiential marketing plan must consider the business buying model. After all, the first rule of marketing is to know your audience, right? That…and don’t market a lousy product. Therefore, experiential marketing for B2B must take a slightly different – but concentrated – path for the greatest success. Focus on brand awareness and expanding your brand’s personal narrative. Experiences give you the opportunity to peel back the onion layers and offer more transparency (without the tears). Whether it’s B2C or B2B, marketers must connect with humans. (Not all buying is programmatic, robot fans.) Keep people at the center of your B2B marketing. Give them memorable moments that provoke emotion, reinforce understanding and build community. Not all brand experiences are event-based. Yet, tagging onto existing events for your experiential marketing efforts often provides a cost-effective way to engage with the right industry audience. Our trade show marketing advice always centers around giving decision-makers hands-on engagements. Whether that’s in-booth or included at an after-hours party, B2B buyers appreciate an interactive experience. New technologies, such as VR, AR or mixed realities, even provide B2B marketers a way to show off the hardest-to-demo products. The last thing you want to do though is to show up without an experience. Immerse trade show attendees through a creative, integrated, hands-on engagement. Similarly to trade shows, conferences are a great way to connect with the right industry audience in one location. Conferences provide a platform for brands to engage with the audience they draw – from influencers, educators and industry leaders. It may be an existing conference, or your brand may want to launch its own conference. Regardless, aligning your brand among thought leaders and educational sessions positions you as an industry leader with great know-how. If you’ve ever taken the Ben & Jerry’s factory tour, you’ve learned first-hand how they turn milk into pints of dreamy deliciousness. They share their history, show you the vats used in manufacturing, teach you about their flavor creation and finish off with a creamy taste. You may have even walked through their infamous flavor graveyard. B2B brands can embrace the nature of a factory tour, even if they don’t have on-site manufacturing. Turn your showroom, office space or manufacturing floor into a museum for your prospects and clients. Invite them to get a behind-the-curtain look at more than just what you do – but who you are. Company tours are amazing at spotlighting corporate culture, the personality of your brand and the chemistry between employees. It doesn’t get more authentic than bringing them into the heart of your operation. When you finally score your first date with your dream girl, you want to give her the royal treatment. This is the same approach you take when you nurture prospects and existing clients. Experiential marketing for B2B brands gives you an opportunity to build the credibility for your brand. Dinner affairs, cocktail hours or special events designed to pamper guests while also allowing open conversation is one way to grant VIP status among key contacts. One pointer is to mix up the guest list with existing brand advocates (your top clients) with your ideal prospects. “To give a great ‘trust’ experience, it’s good to showcase customer results in the form of intimate physical events that allow for customers to mingle with prospects. They’re sharing a great experience while learning about the value of the product,” advises MaryAnn Holder-Browne of One Network Enterprises. One insurance brand we work with adds a twist to their VIP events. They treat their brokers and plus ones to limo service and a nice night out. The surprise is that they turn dinner into a cooking competition, where they learn how to make a meal and then prepare it themselves! Kick up your VIP events a notch with a once-in-a-lifetime experience. Take a group of your clients skydiving, sailing or skiing. Or, rent a beach house on a tropical island and give them spa, sun and sips. A ‘vacation’ or wild excursion creates bonding moments that expand into real friendships. Giving them an adventure will juxtaposition your brand with their personal memory every time they retell of their trip. Personal experiences, like these, are an exciting way to approach experiential marketing for B2B. They build stronger relationships. If you have established valuable brand partnerships with other companies, include them in your B2B experiential marketing plans. If a vendor, they benefit from your growth, and they’ll want to support you. If another type of partner, they may see value in co-branding the experience for your audience of decision-makers. Your partners offer greater exposure to your company, products and experiences. They may also be able to add more value to an event or giveaway. Be sure to reciprocate and collaborate for their brand’s well-being, too. Earlier in this blog, we established that many B2B buying decisions are made by multiple stakeholders within a company. Therefore, it’s important to create and share collateral that your prospects can take back to a larger team. The physical items they leave your B2B brand experience with will extend the reach of your messaging. Expand your swag offerings to be team-oriented or something that’s useful for a work environment. Think about the way people will use your swag – and where. The impression of your logo may be valuable to others at your client’s office. Or create unique and interested sales and marketing collateral that is designed for sharing. Put thought into what you want to send back to the office with someone. Encourage them to show it off, pass it around or engage with it. If someone isn’t engaged with your experience, using the swag as follow-up or for retention purposes may be better suited for your take-home investment. Experiential marketing for B2B brands doesn’t have to be flashy or expensive. One place to start is to look at the buyer journey someone has with your company. Are there ways to improve the experience as someone moves through the funnel? Once a lead is generated, how are sales and marketing cultivating that relationship? Perhaps your welcome email series could feature a dramatic video series or a comic strip column. Maybe you launch a gamification email series, that allows users to click and play and score electronic points. ‘Chunky mail’ – that’s what I call direct mail with something fun and physical inside – could provide mini-experiences for those considering your product. Is there something they can open and interact with at their desk that helps them better understand the value of your brand? Experiential marketing should be considered at every touch point with your brand. It’s not a one-and-done event. It’s a way to bring your brand to life for each account across every engagement they have with you. Experiential marketing takes into account the user experience; small steps could make a large impact. Host an awards show. Or create your own Shark Tank. By giving clients awards – even if they are whimsical, totally made-up awards – you are rewarding people for working with you. And that’s always special. Whether you go the prominent route or the just-for-fun way, an award night gives you the chance to say thank you to your top accounts and allows you to put your best clients on stage. Perhaps your company is in a position to award innovative thinking. Host an event to hear people’s ideas and let them pitch new products to you. This also gives your employees a chance to shine, for those who aren’t comfortable bringing their ideas to you on a daily basis. Depending on the idea, your company may have the means to buy the intellectual capital and turn it into a revenue opportunity. Not only will your marketing team benefit from either of these experiences, your PR and content teams will be able to leverage these for the year ahead. Don’t forget the live stream and to invite your media friends. Your experiential marketing for B2B purposes may be used to gain wider industry promotion. 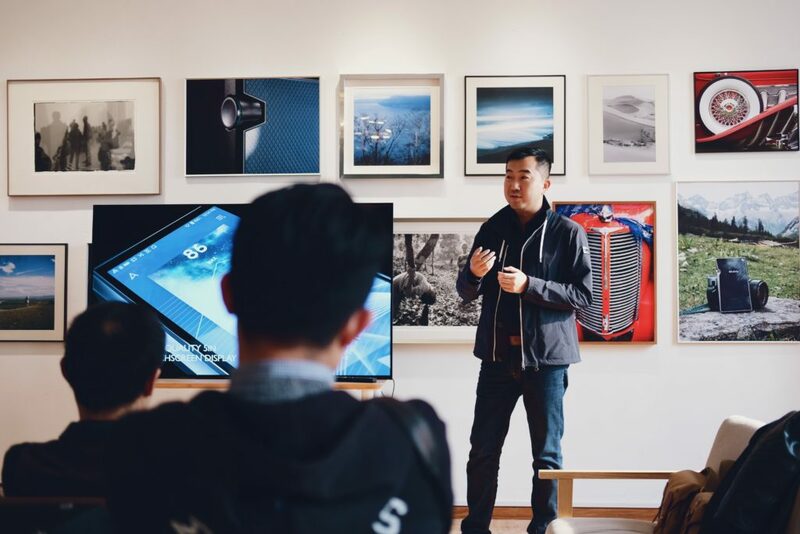 Hosting an experience – such as an event chock-full of interactive stations – could encourage the influencers, reporters, journalists and bloggers in your space to get to know your brand a bit better. (And then of course write or post about you!) Experiential press conferences are a great way to stir up some buzz but also build deeper, meaningful relationships with those influential voices in your industry. When you plan your B2B experiential marketing campaign, you’ll be checking off the boxes that benefit you. You’ll want to include a photo opportunity, take-home content, product education, your company’s story, etc. But don’t forget to fork over some valuable insight for your clients. For example, a digital marketing firm may want to offer 15-minute Google Analytics sessions. Each client’s GA is reviewed, and your rep can even help them set up a new conversion to track or answer their questions. This provides the client enormous value without giving away the farm. Consider the real value you can deliver and how you can customize it for each attendee. Offering these valuable, personalized insights will prove out better ROI in the end. Location, location, blah. You know the saying. If they can’t come to you, go to them. Perhaps you’re interested in a guerrilla marketing effort, where your team pops into key prospects’ offices with coffee, treats and a mariachi band. (What’s wrong with mariachi?) Unannounced or pre-planned visits can certainly grab attention of everyone working in the office that day. It also shows that you’re willing to show up and work for that business partnership. Not ready to barge in the front doors? Perhaps you can set up a pop-up activation outside the prospect’s building. You could create a mobile barista station to greet staff as they enter, a shipping center that offers convenience or a product demo booth to raise awareness of how you can save their everyday, as examples. Gemalto’s mobile tour didn’t go to each business location, exactly, but it did visit key markets where clients lived, worked and played. These VIP events included a happy hour – and an interactive reverse escape room. They were pre-planned events with invites that went out in advance. Whether you’re popping up or popping in, bringing the experience to your clients and prospects eliminates barriers of entry. If you’re a brand that sells to both businesses and consumers, a B2B2C mobile tour may be the solution. Developing an experiential marketing campaign that can travel to your business prospects one day, then set up at a community fair the next, is a cost-effective approach to reaching a variety of audiences. One brand experience can catch two fish with one worm. A well-planned mobile tour can maximize your exposure to two audiences, a business audience and a consumer audience. For example, your branded food truck can provide lunch to key accounts and then set up at a busy park or festival for the remainder of the day. A few small tweaks to messaging makes it relevant in both circumstances. Let’s face it; corporate training can be the snooziest. Sitting still for 8 hours straight, staring at a white board and listening to an instructor…. Zzzzzzzzzzz. If you are on-boarding new clients or providing educational content to prospects, you don’t want to bore them at your trainings. Besides, people learn best when they are doing. Give them hands-on activities that allow them to customize their own training. For marketing’s sake, work in opportunities for the trainees to share content, refer a friend or stream back to their co-workers in a fun email share. Marketing can certainly improve existing business functions – like training – while integrating promotional content with hands-on activities. Just like B2C experiential marketing, design your brand experience to be interactive, memorable and shareable. This list of tactical ideas that you can implement are only thought-starters. To launch your experiential marketing for your B2B brand, give us a ring-a-ling.